Corning® FBS, US Sourced, Premium Dialysed. Corning® Embryonic stem cell qualified FBS. Corning® FBS, US Sourced, Gamma irradiated serum. Corning® FBS US Sourced, IgG Stripped. Corning® FBS US sourced serum, tested Tetracycline negative. 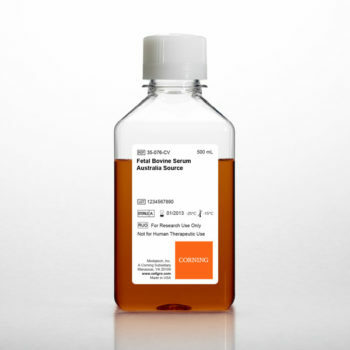 Corning® Fetal Bovine Serum (FBS) Australia origin is a premium quality serum to supplement cell culture.